Good clean fun. No mess, No fuss, No worries. Ever see a two year old mesmerized for two hours? YOU WILL !!! Ever see a ten year old fall over laughing? YOU WILL !!! Carnival mirror is an awesome low cost decoration for a party and when finished it can be stored for later use or up-cycled into several kaleidoscopes or other craft items with a standard scissors. 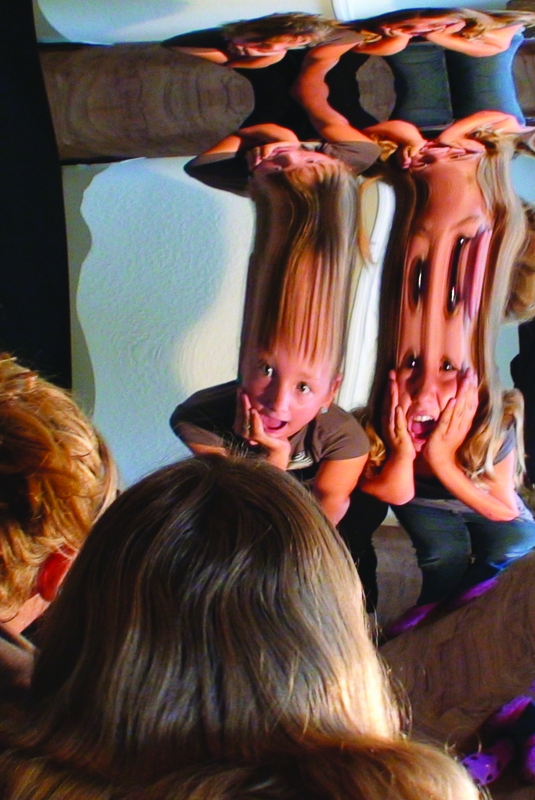 Carnival Mirror is SAFE, UNBREAKABLE, FUN, NONTOXIC, FUN, EASY TO USE, FUN, EDUCATIONAL, FOR ALL AGES and did we mention FUN. Awesome for Halloween - Try a front door display! Every Kid stands in front and appreciates seeing themselves as they search for candy. We are in hundreds of haunted houses as the only legal safe option in all states. Often used as a false door creating a pile up of people trying to escape...hope you enjoy a good fright! Our mirrors have been displayed in countless libraries, doctor's offices and places of worship and we hear about many other funny uses. Our humble mirror is often found in a school locker or backpack, can be used as a light signal for forest or sea rescue. They even enhance phone reception behind the antennae. Many a Library has one displayed on a wall or door and as a craft item they can not be beat! Kaleidoscopes for under $1 are super fun to make. SAFETY CONCERNS - You Should know: Our product is a non backed mirror on a high quality clear plastic sheet. It has cut edges and slightly sharp corners. In the past 19 years we have never heard of any injury from these mirrors, even when used by children as an unbreakable wall in a haunted house to run into. We would like you to think about safety too, be careful and responsible to ensure there are no accidents. We have installed these as replacements for ruined expensive plexiglass mirrors around the world and some shaded outdoor playgrounds, they can last for many years before showing deterioration. As a quick use prop they are awesome and inexpensive just do not focus any sunlight unless you are trying to make a solar collector...Even our small mirror 5.5" by 8.5" could create a dangerous beam of heat! Think of a large magnifying lens that can easily burn in seconds. For very young children this item should never be allowed to focus sunlight. Moisture will eventually etch the metallic side if it remains wet. Do not use as a hand held antenna in a thunderstorm, do not place in a microwave, and please have safe fun !